A devastating 7.8 magnitude earthquake struck near Nepal's capital of Kathmandu on April 25, leaving more than 4,000 people dead, many still missing and countless without basic necessities and medical care. Rebuilding efforts are expected to total in the billions. There is a massive international effort underway to provide aid to the region, and dozens of organizations are offering their services. People around the world want to help, and we've gathered a number of ways you can donate to assist with ongoing relief efforts. Along with organizations like the American Red Cross, tech companies like Apple, Facebook and PayPal have set up ways to donate to relief efforts. iTunes: As it has done for disasters in the past, Apple has linked iTunes up with the American Red Cross. When users head to the iTunes Store, they'll find a page with donation options to send funds to the Red Cross' relief efforts in Nepal. 100% of donations are sent to the organization's Nepal disaster relief efforts. Since most users keep payment information on iTunes, it takes a quick click to donate funds. Facebook: You should notice a message at the top of your News Feed starting today with the option to donate to the International Medical Corps. The organization has mobile medical units on the ground in Nepal, delivering emergency care to the hardest hit regions, according to a Facebook Newsroom post. Users can donate directly to IMC using Facebook's Donate feature, and Facebook will match donations up to $2 million. The company also activated its Safety Check feature. 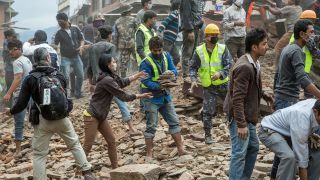 PayPal: PayPal has set up a campaign called Nepal Earthquake Relief and Recovery, giving users a one-click option to choose which organization they would like to donate to. 100% of donations go to the organizations as PayPal is waiving all fees. Organizations you can donate to via PayPal include the World Food Program USA, AmeriCares, International Medical Corps and Habitat for Humanity, among others. At the time of this writing, the campaign had raised over $264,500 for the various organizations. GlobalGiving: Donations are being accepted via the GlobalGiving.org website, but US residents can also text "GIVE NEPAL" to "80088" to donate $10 towards the Nepal Earthquake Relief Fund. The organization is looking to raise nearly $1.7 million. T-Mobile: Text "NEPAL" to "20222" to donate $10 to Save the Children, "NEPAL" to "864233" to donate $10 to UNICEF, and "NEPAL" to "777444" to donate $10 to World Vision. 100% of donations go to the charities and will be charged to customers' phone bill. Sprint: Text "REDCROSS" to "90999" to donate $10 on behalf of the Red Cross Disaster Relief Fund, "WFP" to "50555" to donate $10 on behalf of the UN World Food Programme, "NEPAL" to "20222" to donate $10 on behalf of Save the Children, "NEPAL" to "864233" to donate $10 on behalf of UNICEF and "AID" to "27722" to donate $10 on behalf of the UN World Food Program USA. Google and Microsoft have launched initiatives to help as well. Google's has set up a dedicated Person Finder so people can look for someone or provide information about an individual. In addition to the online Person Finder tool, Google has set up SMS search. Microsoft is also now offering free Skype calls to landlines and mobile devices in and out of Nepal. In addition to donations, the company said it will continue to assess how its technology and people can help in rescue and relief efforts.